The pre-calculus curriculum is one of five Time4Learning math courses offered at the high school level. Pre-calculus is taught using practical, real-life math problems delivered by a combination of multimedia lessons, instructional videos, printable worksheets, quizzes, tests and both online and offline projects. Calculus is the study of change. Pre-calculus allows students to extend what they have learned in algebra and geometry to answer more complex questions. In pre-calculus, students learn concepts through lessons and practice. 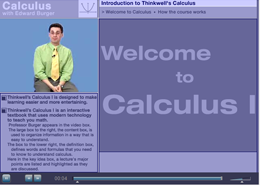 After completing this course, students will be prepared to study Calculus.